Vitamin D status of seminomadic Fulani men and women: Glew RH, Crossey MJ, Polanams J, Okolie HI, VanderJagt DJ. ; Author Affliations: Department of Biochemistry and Molecular Biology, School of Medicine, University of New Mexico, Albuquerque, New Mexico 87131-0001, USA. Applications: A labeled prehormone. 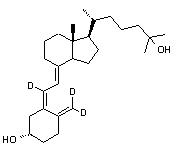 A major metabolite of vitamin D3. Levels measured to determine a patient's vitamin D status.